We have ordered sunshine, so come join us for this one off winter ride for adults to gain confidence cycling in Christchurch! We will mainly ride along some of the quieter public roads, new CBD cycle infrastructure and parts of Hagley Park. There will be stops along the way to share tips on how to have a safer and more enjoyable ride... we will even have a few free bike safety accessories to give away! This ride will also include a short stop at the Bus Interchange to try out the newly installed test bus bike rack. Meeting place: Cathedral Square, by the Police Kiosk. 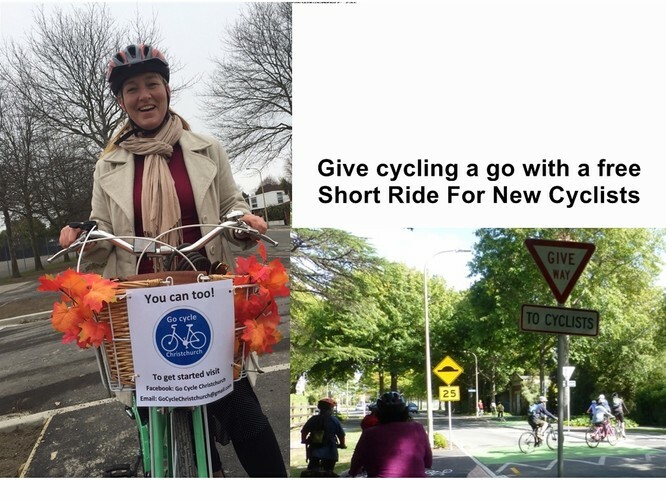 Number of participants is limited to around 10 new cyclists, so to avoid disappointment please let us know that you are coming via email GoCycleChristchurch@gmail.com or 021 0277 9250 - first come first serve. More experienced cyclists are welcome to join too, just remember this ride is slow to accommodate new cyclists. So grab your bike, helmet and a friend if you can and join us. Don't have a bike? Sign up to Nextbike to get your hands on a bike from one of their 6 CBD stands. We will then provide you with a code after the ride to get your bike rental for free. You will be responsible for your own safety, so you need to be able to ride your bike and know about the general NZ road code. If the weather is nasty on the day this ride will be postponed to Sunday 18 June 2pm - see Facebook event page for any updates on the day. Hope to see you Saturday 17 June for a slow enjoyable cycle ride.